Crunchy on the outside and soft on the inside, these vegan baked potatoes with cornmeal crust make the perfect side dish. The last recipe in this Polenta Series on Where is My Spoon, I really hope you found a few things you liked. As a native Romanian I obviously enjoyed each of the posted recipes, but I do hope that I could offer something to those of you who are not familiar with polenta and its endless variations. 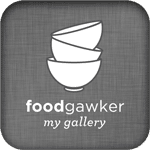 There are so many other delicious recipes I could think of, including polenta or cornmeal, quite a few that I have cooked and photographed but still not posted, because other ones seemed like a better choice. I really had a hard time choosing. I made these baked cornmeal potatoes for the first time sometimes before Christmas, when I was starting to plan the polenta series. I think it might have been the first recipe I photographed for this series. I found the recipe in an old Romanian recipe magazine, something that my aunt used to send me from Romania a few years ago. I was a bit skeptical about it at first, I thought the crust would be too gritty, but then I thought that a try is worth it, we love baked potatoes and it would be great to have another version of them, in case the recipe was good. So I did give it a try and it was really well worth it, we all loved the baked cornmeal potatoes so much, that I have been making them regularly ever since. They are so easy to make and so delicious, you will keep making them too, once you have tasted them. They make a perfect side dish for any kind of roast or steak, for chicken or fish. We had them as a main meal as well, with salad, vegetables or pickled vegetables, a yogurt or chili dip and once with some bacon on the side. Basically, lately, whenever I don’t have much time to cook before the kids get home after school or kindergarten, I either make a quick soup or these baked cornmeal potatoes with a dip and salad. And I never hear any complaints! The use of spices is really up to you, using paprika and garlic makes them more Romanian I suppose, but you can vary the spices to your liking. I use regular teaspoons and tablespoons to measure the ingredients, not the American measuring spoons. Preheat the oven to 250 degrees Celsius/ 480 degrees Fahrenheit. Line a baking tray with baking paper. If you use organic potatoes (and if you like it), you can leave the potatoes unpeeled. Just scrub them very thoroughly. Otherwise peel the potatoes. Halve them and cut each half into 3 or 4 slices, depending on the size of the potatoes. 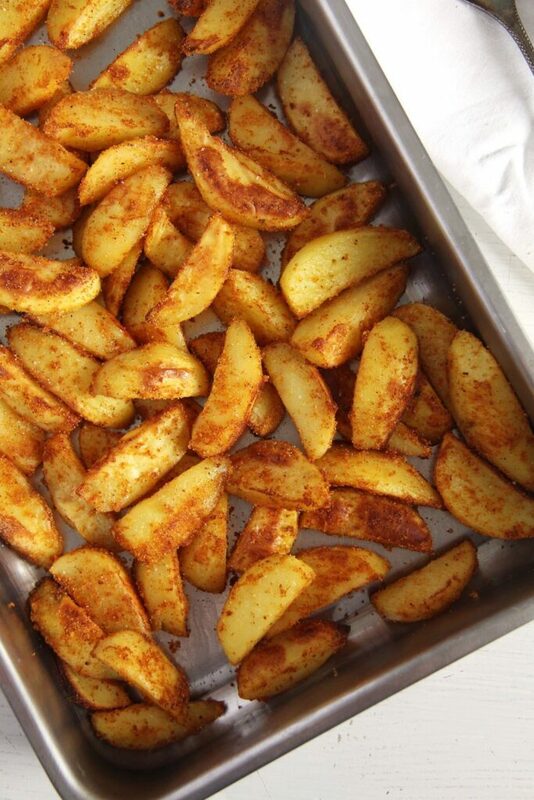 Place the slices in a large bowl, add the olive oil and mix it with the potatoes using your hands. Make sure that all the potatoes are cover with a thin film of oil. In a small bowl mix together the cornmeal and all the spices. 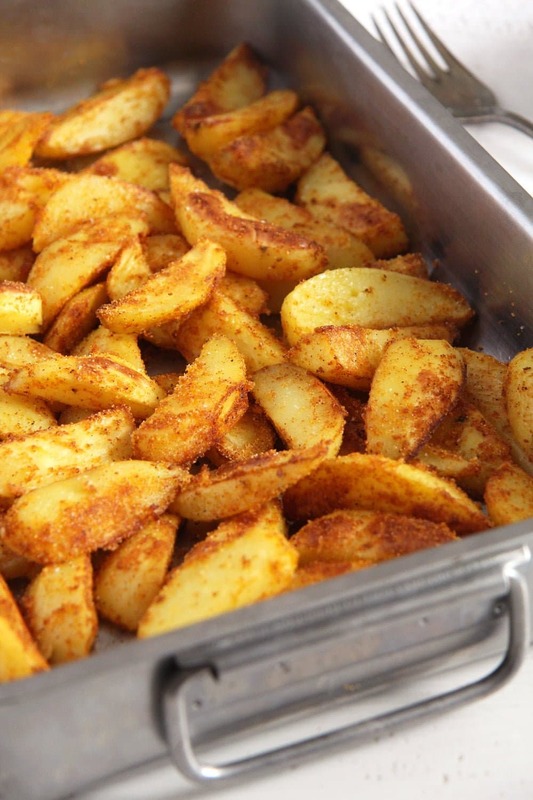 Give them to the potatoes and shake the bowl thoroughly to make sure that all the potatoes are covered with the cornmeal mixture. 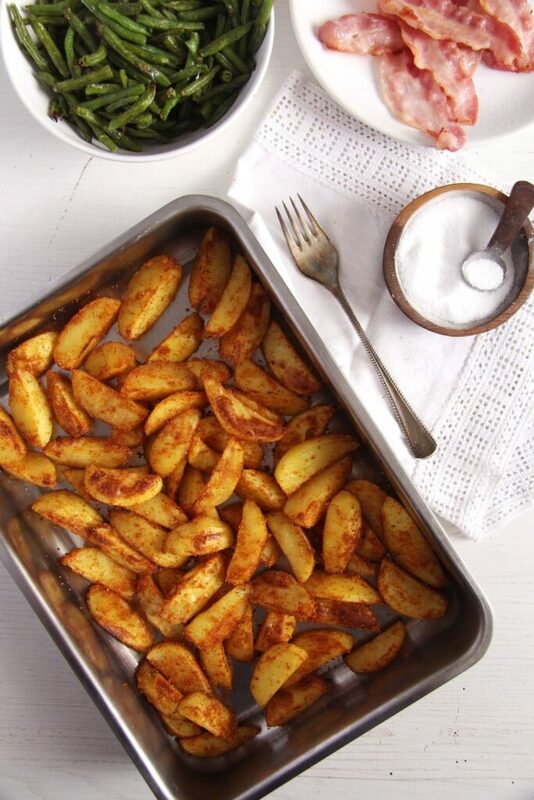 Arrange the potatoes in a single layer on the baking tray. 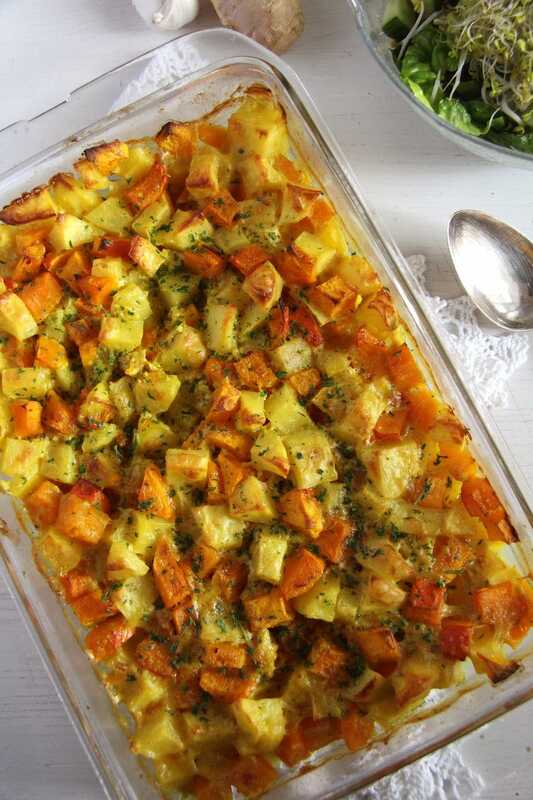 Bake for about 35 – 45 minutes or until the potato flesh is very soft and the crust is crispy. Serve immediately as a side dish or with salad and dip. I use regular teaspoons and tablespoons to measure the ingredients, not the American measuring spoons. Oh, yes! Love those baked cornmeal potatoes! As Italians, we love polenta and we eat it a lot! Actually, we just had it 😉 . They would be so crispy on the outside, yet soft on the inside, pure deliciousness! It’s funny that you said you used regular teaspoons and tablespoons to measure, because in every Italian recipe when you read “cucchiaio” o “cucchiaino” they just mean the one you use for soup, or the one you stir your coffee with 😉 . This is a genius idea! 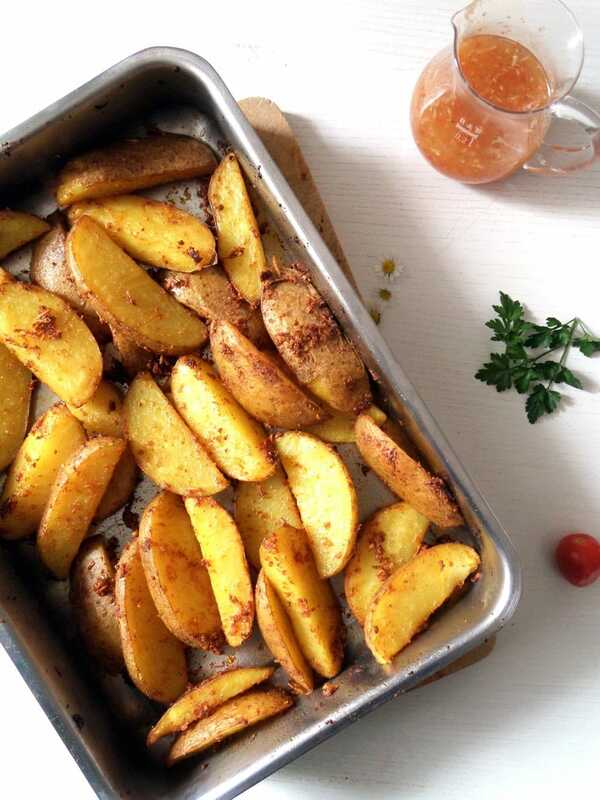 I love to use cornmeal for oven baked tofu and tempeh, but never ever thought of preparing potatoes this way too. Seriously amazing, thanks for the idea!!! It sounds super delicious, Adina! I have never tried to sprinkled my baked potatoes with cornmeal but I will do it from now. It is a real great idea! It gives them a light crunch. What a fantastic idea! I bet they are much crisper than without the cornmeal. I must finally take out my cornmeal and cook with it! I’m a real potato girl and this recipe is one I’ll definitely be trying soon. I’ve pinned it. Loved your whole polenta series, Adina! I thought the crispy chips were my favorite but these potatoes look awesome. 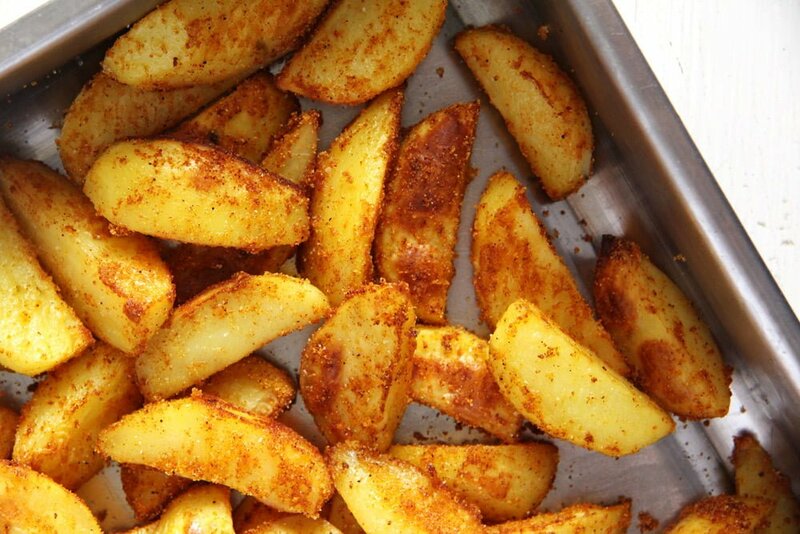 Your spicy potatoes recipe was delicious so I know these will be fantastic too, pinning! What a great twist on roasted potatoes! Love how the cornmeal yields that crusty exterior. 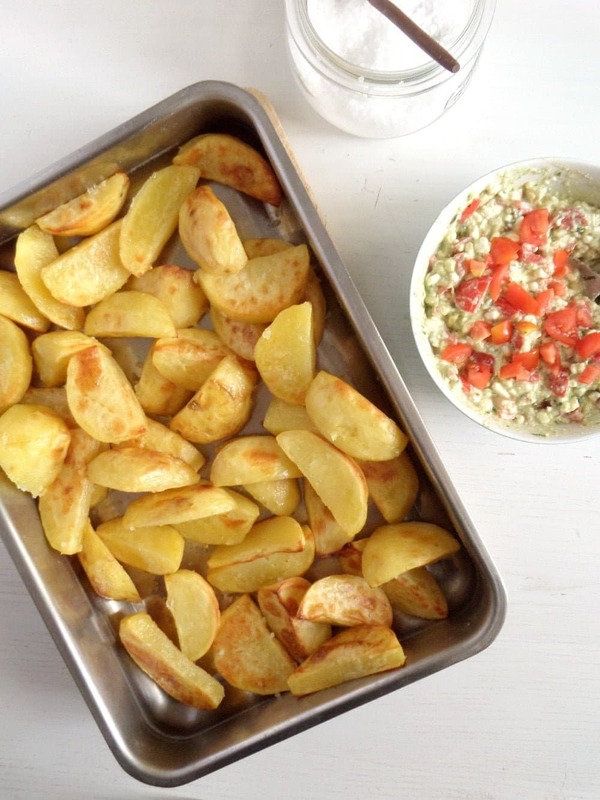 The quality of potatoes you call for…which is it 1 Kg (which is more like 2.2 lbs) or 1.1 lbs? I assume you mean 2.2 lbs, but you specify both quantities in the recipe. You are right, Fred. 1 kg are 2.2 lbs. Sorry about that.